A true virtuoso weds rich artistic sensibility with a mastery of the instrument the artist chooses to express it. Therefore, Art Tatum was a true virtuoso, whereas Miles Davis wasn't, he had artistic expression in spades, but his technique on the instrument was limited. 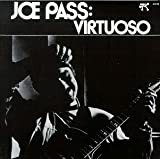 It takes a lot of confidence (or gall) to label yourself a virtuoso; luckily, Joe Pass is able to deliver. Pass recorded widely in the seventies, which were considered lean years for jazz guitarists. 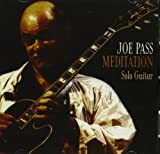 The most recent innovations of the time involved the rock-influenced freakouts of John MacLaughlin and Sonny Sharrock; Pass was responsible for returning to calmer waters by playing the same standards musicians had relied on for years in the familiar chord-melody style. The real marvel here is that Pass, forgoing the trio format from previous outings, plays entirely without any accompaniment; this was a format where few guitarists had ever dared to venture. An entire album of the stuff was almost unthinkable, yet Pass, who had singular notions of what could be done with the guitar, mastered it to wide acclaim. One of those landmark recordings that revolutionized the way an instrument was played, it still sounds fresh and brimming with novel concepts of even 25 years after it was recorded. Like Art Tatum, Pass is a delight to listen to, but can be a bit difficult to absorb all at once. He packs a lot into each song-lightning fast chord changes are interspersed with dizzying scales and arpeggios, all of which are played at a baffling speed. What's most amazing is that on a song like "On Green Dolphin Street", Pass can stray from the melody, weaving in related elements (as Tatum would) yet still having a clear idea of the song's structure and making it all fit. Despite his talent, the format wears a little thin after a while; this is an album best listened to in small doses. Yet the charms of this album, which feature a classic sense with a modern sensibility, are addictive. Understandably, this album won Pass well-deserved international acclaim and a host of disciples and spawned a series of "Virtuoso" recordings. This album is probably the best of the bunch and one of the few classic jazz albums produced in the seventies. Track Listing: Night and Day, Stella By Starlight, Here's That Rainy Day, My Old Flame, How High The Moon, Cherokee, Sweet Lorraine, Have You Met Miss Jones?, 'Round Midnight, All The Things You Are, Blues For Alican, The Song Is You.